Almost every wood shop has equipment that was purchased as a result of a visit to a wood industry trade show — or trade fair as they say in Europe. But do these events still call out to your shop, like Sirens to Odysseus, sweetly singing about tools that will make your business more productive? After all, the internet, the inbox, trade publications and visits from the friendly neighbourhood sales rep provide plenty of information about what might make sense for your shop. During the 1990s, business analysts, consultants, and participants alike debated whether the surge in electronic commerce and Internet purchasing options might soon render the trade show an irrelevant relic of a bygone business era, according to Inc.com. Even after a slowdown in growth in the first three years of this century — due to post 9/11 decline in travel and a global economic slowdown — the trade show industry has grown steadily. For example, these trade shows accounted for more than $100 billion US in annual direct spending and attracted nearly 125 million individuals in 2004. “In many industries, the trade show has become a must-seize marketing opportunity,” stated Business Week. For exhibitors, “It’s a time to meet prospective customers, get valuable feedback on your product or service, and close sales.” According to Center for Exhibition Industry Research (CEIR) based in Dallas, Tex., 92 percent of trade show attendees say they are looking for new products. The performance of the trade show industry as a whole, as measured by the CEIR Total Index, posted a decent year-over-year first quarter 2018 gain of 1.8 percent. Building, Construction, Home and Repair; Industrial/ Heavy Machinery and Finished Business Inputs; and Government all registered robust year-over-year gains. In contrast, Consumer Goods and Retail Trade and Education posted year-over-year declines. The most important step for the attendee is to find a good show that is worth the time and trouble it takes to attend, Inc.com notes. Businesses should request detailed statistical and other information on past trade shows from the organizers. Once you have identified a show to attend, good planning is the key to a successful trip. Make your travel arrangements and submit the show registration far in advance. Allow at least 90 days to avoid snags and delays. Decide in advance what you are hoping to get out of the show — if it is a buying trip, know in advance what you hope to purchase. Certainly, the challenge of all wood shop owners and managers is taking the time away from production to travel and attend these shows both in Europe and elsewhere. 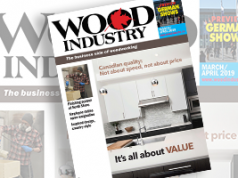 Ralph Fehr, majority owner and operations manager at Elias Woodwork in Winkler, Man., usually goes to one show a year somewhere, often either IWF or KBIS. “I do it, so I can stay abreast of the developments on the equipment side of things,” says Fehr. There is a danger of being on the bleeding, rather than the leading edge of technology, according to Fehr. He adds that there are two pieces of machinery in his facilities that have been sitting around for years because they weren’t really shop-ready. “I end up having to buy them again later when they had worked all the kinks out, made improvements and made them actually work,” says Fehr. Borys Hayduk, president of Palladium Products in Sturgeon County, Alta., attends such shows as AWFS, Ligna and WMS with the expressed purpose of upgrading his operations and to comparison shop. Hayduk likens the purchasing process to comparing a BMW versus a Porsche, or other high-end automobiles. “So, for me buying a car is kind of like buying equipment. Except it is expensive — it is kind of like buying a couple of Ferraris!” he exclaims. A decision to buy a specific laser edgebander for Palladium Products was sealed by attending AWFS in Las Vegas one year. “For me it was easy because I did the research before going to the show,” says Hayduk. Every one or two years, Blayne Wyton, president of Prairie Barnwood in Morden, Man., makes the effort to get to a show. Because his company sells furniture, the activity is divided between either exhibiting or tool purchasing. He, too, feels the wood industry publicity machinery gear up before shows. Prairie Barnwood will sometimes run into scheduling conflicts between the shows it would like to attend. 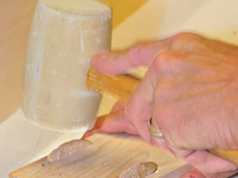 “I would be attending a show as an exhibitor and unable to attend a show as a buyer,” says Wyton, using the example of a cottage show in Alberta falling on the same dates as wood tooling show in Las Vegas or Toronto. “The other barrier that I have found,” he adds, “is that I’m not necessarily looking for equipment, so I won’t go to the show. But if I was to attend the show, most likely I would see things that would work with our equipment. So, it’s making an investment just to go to the show even though I can’t necessarily see a need right away. Fehr has learned the value of doing advanced scouting before making the trek to a show, possibly with other staff accompanying him. Once you arrive at the show, says Inc.com, review the list of exhibitors to see which companies interest you the most, or better yet, comb the list of exhibitors on the organizer’s website ahead of time. Highlight those companies and check them off as you visit each one, Inc.com advises. Some people like to make one general trip around the entire exhibit floor, highlighting interesting exhibits as they go and making a second, more serious trip to those booths. Be warned that this approach may not be practical for the largest national trade shows, which are often spread over several floors of a huge convention centre. “If you want to make good use of the time you have to do a little bit of homework beforehand,” says Fehr. “My guys at work always say they don’t really like travelling. They don’t have very good flight karma, what with lost luggage and delays and weather issues.” To get to Atlanta, Ga., for example, Elias Woodwork staff will require three flight connections to get to or from Winnipeg, Man. There is another way to get to attend shows, and that is as guest of one of the larger machine tool builders, according to Hayduk. “If you bought a lot of machines in the past then the companies would help you. So, if I want to fly to Germany or the United States to see a show and I told them I wanted to buy something they would help. They would help with hotel and anything I need, even get you a cheaper ticket. 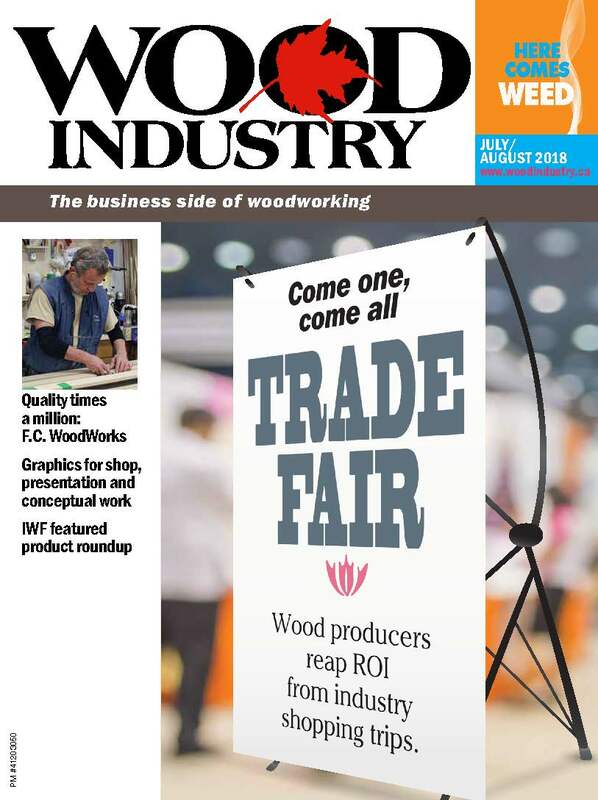 Do not ignore the seminars that are offered as part of most trade shows, wood shop managers and staff have found in addition to making equipment purchases. These may be just as useful as the booths in the exhibit hall and are also a great way to meet people. The speculative nature of attending wood industry shows is not lost on Wyton. “Just being able to attend a show it would open my mind up to what is possible and what the investment would be in order to get a (large) contract,” he says. According to Fehr, it helps to go to a show with a shopping list. “But sometimes I just try to go with an open mind to see what’s new,” he says. “Sometimes you are surprised at some of the new ideas they have come up with for handling certain things. I always feel it is worth my while to do it. “This year I’m taking two of my maintenance and operations guys with me (to IWF) because we have almost another 100,000 sq. 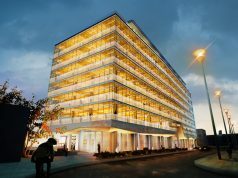 ft. coming to us around New Year’s when a tenant should be out. We have ideas about what we want to do there. Why race builders to the BOTTOM?